WMD Africa Project: Time for a new roadmap to nuclear disarmament? 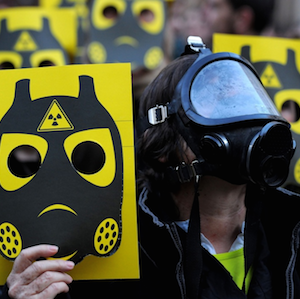 Time for a new roadmap to nuclear disarmament? Seventy years after the destruction of Hiroshima and Nagasaki, the world is no closer to an unequivocal commitment to abolishing nuclear weapons. The recent (27 April – 22 May) review conference of the Treaty on the Non-Proliferation of Nuclear Weapons (NPT) failed to reach consensus on how a world free of nuclear weapons could be achieved, and concluded without a final document. This raises the question whether it is time for a new framework. After four weeks of negotiations at the United Nations (UN) headquarters in New York, the lack of agreement on an outcome document means that the entire plan for global nuclear disarmament and non-proliferation for the next five years is hampered, with the next five-yearly review conference only scheduled for 2020. Regarded as the cornerstone of the global nuclear non-proliferation regime, the NPT rests on three pillars: preventing the spread of nuclear weapons and weapons technology, furthering the goal of nuclear disarmament and promoting co-operation in the peaceful uses of nuclear energy. Who gives the nuclear weapons states the right to use these weapons to annihilate all of us? The treaty commits all states parties, both nuclear weapon states (NWS) and non-nuclear weapon states (NNWS) ‘to pursue negotiations in good faith on effective measures relating to cessation of the nuclear arms race at an early date and … on general and complete disarmament under strict and effective international control’. The NWS (China, France, Russia, the United Kingdom [UK] and the United States [US]) once again refused to agree to a time-bound commitment to prohibit and eliminate nuclear weapons. To the contrary, they repeatedly sought to legitimise their arsenals, arguing that nuclear weapons are essential for their security. Nuclear weapons, unlike biological and chemical weapons, are not banned and continue to be modernised. This presents a perpetual threat to humanity as a whole. The US and the UK also blocked consensus on how to take forward the process of establishing a Middle East free of weapons of mass destruction. Israel has never publically declared or denied that it has a nuclear weapons programme, but is considered by most analysts as having such weapons, like the other non-NPT states – India, Pakistan and North Korea. A call for world leaders to visit Hiroshima and Nagasaki was also rejected. In what has been described as the most profound statement issued by a state to the conference, Abdul Minty, South Africa’s Ambassador to the Geneva-based Conference on Disarmament, reflected the views of most NNWS. ‘Who gives the nuclear weapons states the right to use these weapons to annihilate all of us?’ He argued that the message sent by the five NWS – that it is correct to possess nuclear weapons and that possessing them is necessary for national security – leaves the option open to any other country facing similar security challenges. Additionally, he said, ‘NNWS represent the vast majority of humanity – our lives, our future and our destiny is wrapped up with the arsenal of the NWS … We need to talk about a legally binding framework … because we are all in the same world and we suffer the same destiny as a result of the actions of some of us’. Egyptian Ambassador, Hisham Badr, called the closing day of the conference ‘a sad day’ for the NPT. ‘By blocking consensus we are depriving the world, but especially the Middle East, of even one chance of a better future, away from the horrors and the humanitarian consequences of nuclear weapons’. Civil society groups and survivors of the atomic bombing of Hiroshima and Nagasaki have expressed disappointment at the failure of the NPT review conference to reach consensus. Although the conference did not produce a final document, it did, according to some, produce an alternative in a document referred to as the Humanitarian Pledge. Borne of many years of frustration, 107 states parties, including 33 from Africa, endorsed the pledge. Hopefully, it will establish a new roadmap to draw up a legally binding instrument banning nuclear weapons. According to the International Campaign to Abolish Nuclear Weapons, the pledge reflects a fundamental shift in the international discourse on nuclear disarmament. It sends a signal that the majority of the world’s governments are ready to move forward with the prohibition of nuclear weapons – even if the nuclear weapon states are not ready to participate. These pro-disarmament states could now determine the next steps that are needed for the achievement and maintenance of a nuclear-weapon-free world. In an oral statement issued on 1 May on behalf of the Group of Non-Governmental Experts from countries belonging to the New Agenda Coalition, the group shared its conviction that the total elimination of nuclear weapons is the only guarantee against the use, or threat of use, of such weapons either by states or non-state actors. The statement also called for an urgent meeting of all UN member states to advance the object and purpose of the NPT through negotiations on ‘effective measures’ to complement and complete the treaty’s disarmament framework. Clearly, if the NPT is unable to deliver all of its objectives, including its disarmament provisions, the unfortunate truth is that another forum or regime needs to be established: one that would place the humanitarian impact of nuclear weapons detonations and the security imperative for nuclear abolition, at the core of all its deliberations. The Humanitarian Pledge seems to be a commendable first step towards creating this new roadmap.